Mimi V a writer, social media manager, foodie, music lover, and mum, currently residing in Sydney with Mr V, two little Vs and doggy V.
Cornersmith is one of the more recent entrants to the Marrickville café scene. I seem to remember its opening coinciding with an article declaring Marrickville "the new Paddington." 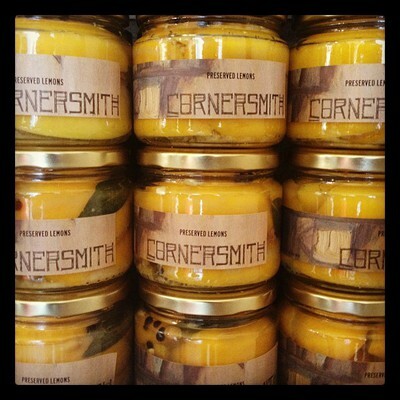 Whilst I don't agree with that prediction – largely because I think that Marrickville is so unique and culturally diverse that it will evolve in it's own sweet way – I would certainly agree that Cornersmith represents the gentrification that is sweeping the suburb. It caused quite a stir when it first opened, and if the queues outside at peak times are anything to go by (you have to write your name down on a chalkboard at the door and wait outside for a table), it continues to do so. It occupies a corner (see what they've done there?) that was once home to a yarn shop. The site has now been lovingly transformed, complete with brown subway tiles outside, white ones adorning the interior walls, and industrial-style lighting. I must say that I love the décor – they've got that rustic French/shabby chic/artfully industrial vibe down pat, and being able to see all the cooking action unfold just behind the counter only adds to the aesthetic. It's not great for prams (sigh), but they do try to accommodate kidie-winks as best they can, by providing highchairs and storing strollers in the back yard, if it makes life easier for you. The food philosophy at Cornersmith is simple, and evident in everything they do – good "clean", fresh, food; locally produced or sourced, thoughtfully prepared, and served with love. My watch out would be that in busier times, they need to remember the "love" bit – as it can feel overly chaotic, and the staff (especially the owner) seem just a that little bit too harassed for (customer) comfort. The choices on offer change according to the seasonal produce available, and are always interesting, with ingredients that you may not have heard of, or being used in a way you wouldn't have predicted. Just reading the chalkboard menu and deciding what to have is an exercise in itself, but the staff are very helpful in explaining what things are or how dishes are served, if you're having trouble deciding. I am always intrigued by the tantalisingly colourful array of pickles and preserves available (all made and bottled on the premises), though am yet to try one. 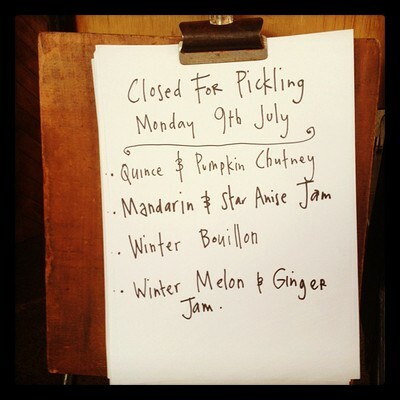 I am even more intrigued by the fact that they are often closed on Monday to carry out said pickling. "Closed for pickling" always puts me in mind of "dog ate my homework, Miss", and is a tad inconvenient when I want to grab the first coffee of the week on the way to the train station on a Monday morning. They also make their own honey and Worcestershire sauce, and grow their own herbs in the backyard (which helps to distract you whilst you wait in the queue for the loo, which is essentially an outhouse). On today's visit we had an apple and purple carrot slice (see what I mean about using ingredients in unexpected ways?) – which was tasty (the toddler seemed to love it, though it was a bit "earthy" for my liking, and also a bit burnt in parts), if a tad expensive, at $8, and the poached eggs which came with an onion relish, they were perfectly cooked and reasonably priced at $9. We didn't finish most of the slice, but they were very happy to bag it up for us to take home. Their coffee is good (bordering on the bitter, but not quite), but in a suburb like Marrickville, it would want to be these days.